The Mesita is from Asolo's Natural Fit range so it's built around a design developed to be a better match for the foot's natural shape. This means that the boot is wider around the front, metatarsal area and the lower part of the sole is shaped so as to cradle the foot. The heel is also a little more rounded. Of course, none of this refinement is immediately apparent from looking at the boot. What you see is a mid cut, light weight, attractive looking boot with a decent amount of padding around the ankle and in the tongue. It's very flexible along it's length and laterally, there's plenty of toe protection and the heel feels quite sturdy. Turning it over you see a robust looking, two coloured sole with a varied 3mm lug pattern. The lacing system is quite simple and worked well. Fit-wise, I think that they may be a little bit shorter in length than the average. I was wearing my usual size and I certainly felt that my toes were a little nearer the front of the boot than is the norm for me. When actually walking in the Mesita I did feel that my entire foot (and particularly the heel) were well supported. (In fact 'cradled' - the term used by the manufacturer - is quite a good description.) The Vibram sole gives excellent protection and traction on stony ground, asphalt, wet grass and mud. They've kept my feet dry through wet grass, and the light to medium rain that's been a feature of the 2014 Peak District late winter/early Spring weather! 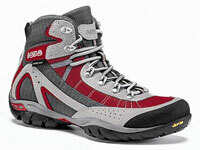 Asolo's Mesita are a great looking, comfortable and light weight, 2-3 season walking boot; great for all year day walks over moorland, in woodland, on the coast - they will also suit the spring/summer Lake District day walker.